Discover the beauty of Rome with the guided tour of the Colosseum that starts early in the morning: don’t miss the chance to see the Eternal City in an unforgettable and unique climate, with the advantages of a skip-the-line ticket which saves you a lot of time.The tour includes three of the most representative attractions of Rome: Colosseum, Roman Forum and the Palatine Hill. 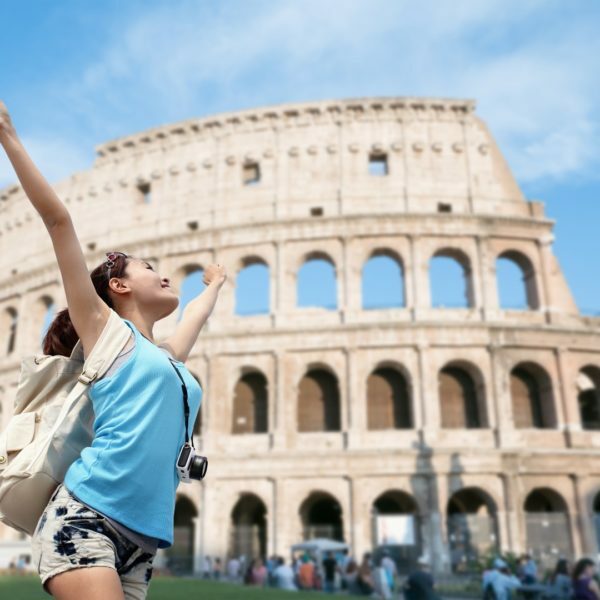 With one of our very wee versed licensed guides, who will happy to share with you anecdotes and curiosities on Roman history, you will start from the Colosseum, that goes also by the name of Flavian amphitheatre. It was the very core of the entertaining for the ancient romans. Lots of free performances took place in the amphitheatre: gladiator fights, sea battles simulations, fights between gladiator and wild animals that came from the most exotic spots of the Empire. During the tour, helped by the guide, you can admire the architectural structure of the building, discover its secrets and see how its physiognomy changed through the centuries to the present day. Once you leave the Colosseum, your tour will continue at the Palatine Hill and Roman Forum. The Palatine Hill is the most famous of the seven hills of Rome. According to the legend, this is the very place where Romulus in the 753 b. C founded Rome after killing his Brother Remus. On this hill, the emperors had their city residences built. Here you can see the ruins of the hut of Romulus, the house of Augustus, the private hippodrome of Domitian and much more. The Roman Forum will be the last step of our itinerary. It was the centre of the social, political and religious life in Rome. We will walk along the Via Sacra, where the parades of Triumph took place, and visit the most important locations of Roman diplomacy, such as the Comitium, the Roman Curia and the Rostra, where the people met the Senate . in the Roman Forum you will recall the history of the Ancient City from the Roman Kingdom to the decline of the Roman Empire. Book a guided tour of Colosseum online now and explore the city with a local!